Garrett Maines Interview: Jays Catcher Prospect- on that Minor League Grind Just Tryin to be Showbound! MLB reports – Jonathan Hacohen: When you think “Blue Jays catcher”, the names Arencibia and d’Arnaud. Arcencibia is the Jay’s power hitting major league catcher, who has quickly become a fan favorite in Toronto. Travis d’Arnaud is one of the Jays top prospects in the minors- and actually, one of the top prospects in the game, regardless of pitching. With the Jays as an organization having some of the best catching talent in baseball, we are ready to throw more names in the mix. Back in December, we interviewed Jays catcher George Carroll. 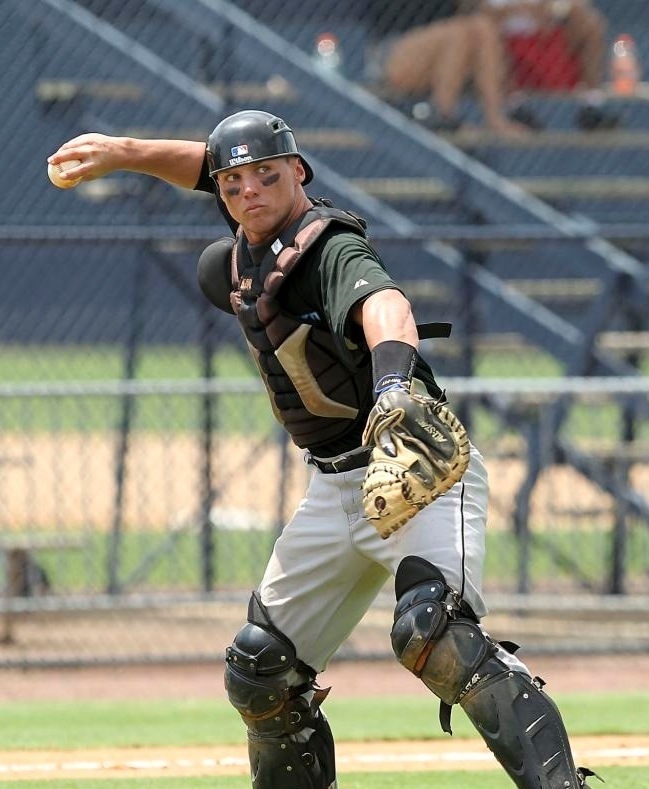 Well, the Toronto Blue Jays have a serious catching factory going, as we were lucky to get some time to speak to catching prospect, Garrett Maines. First question: You play professional baseball for a living. Has that sunk in yet? Signing my first professional contract was very exciting knowing that I had achieved one of my lifelong goals. It took a lot of hard work and it didn’t come easy. It was both rewarding and humbling at the same. Now that I have finished my second off-season, the thought of being a professional athlete has definitely sunk in. The City of Tampa is saturated with professional athletes and professional teams, so it’s definitely a good feeling to be a part of the local “fraternity” so to speak. During the off-season, I am also lucky enough to hang out with a few very successful current and former professional athletes. Being around them inspires me to work even harder to achieve some of the successes that these guys have already realized. What is your brand choice for bat and glove? For about four years now I have gone with the All-Star catcher’s mitt. In my opinion, they make high quality catcher’s gear with good leather that lasts longer than most mitts. I prefer the 34-inch mitt because it provides a better receiving target for my pitchers. I usually go through 2 – 3 mitts per season. As far as bats go, I prefer to use the bigger barreled bats such as the C243. I use a 34 inch 32 ounce bat and prefer maple over ash. This past season in Vancouver, my grandmother was actually the one providing me bats and mailing them by the half-dozen to me in Canada! I come from a huge and deep-rooted baseball family so I know I can count on my grandma to find me some good lumber! I am definitely a fan of the game and a fan of many players throughout the major and minor leagues. 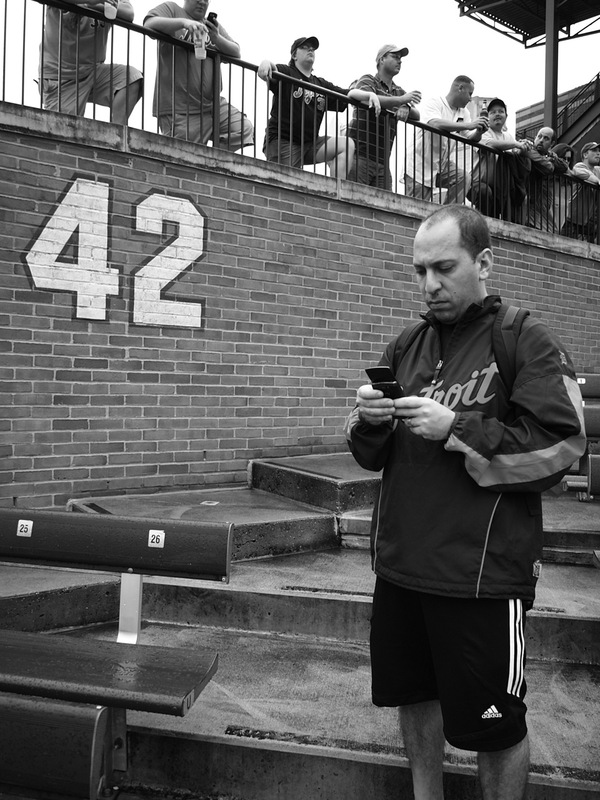 A player that I have not only loved to watch, but have strongly admired since I was ten years old is Derek Jeter. As a young man, I wanted to be just like him in every way. From being a big leaguer, to Captain of his team and being a world champion — who wouldn’t want that? But as I got older I began to respect him not only for what he did on the field, but how he handled himself off the field. Now, as a professional ball player myself, I have had the opportunity to meet and talk with him on multiple occasions. I still feel today how I felt when I was ten years old when it comes to Jeter. What are your goals entering the 2012 season? From an organizational standpoint, for 2012 I would like to do what I can to continue to move forward with my career and continue to move up a level as each season passes. As far as what I would like to accomplish with whatever team I am sent to, I certainly want to experience the feeling of winning another league title like we did with the Vancouver Canadians in 2011. The managers and coaching staff that the Jays have provided to each affiliate allows every level the possibility of obtaining the championship ring. My personal goals consist of staying healthy, continuing to learn how to grind out a full professional season, calling good games and earning the trust and respect from not only my pitchers and team, but the entire Jays organization as well. Offensively I would like to get a couple hundred at-bats under my belt in order to produce the numbers I know I can produce. I am confident in my off-season work regimen and have made a few minor adjustments in order to be successful at the next level. I have demonstrated that I am very confident in my offensive capabilities and look forward to producing and helping my team get some W’s. Defensively, I’ll continue to be a sponge during Spring Training and soak up all the information from guys like Mike Redmond, Sal Fasano, John Schneider and Doug Davis and hopefully apply their past, present and future knowledge to current game situations and opportunities. I’ll continue to polish relationships with the pitchers I already know, and look forward to starting new trusting relationships with pitchers that I will soon cross paths with. Tell us about the process of signing with the Jays? In front of 20+ people at my parent’s house in June 2009, I chose to say no to the Pirates in the 19th round because the benefits of staying in school and keeping my college eligibility outweighed the benefits of signing a professional contract at that point in time. Going into the 2009 draft, I had certain expectations that had to be met in order for me to leave college just a few credits short of a double-major. I elected to pursue my degree. After completing my degree, I decided it was time to turn pro. Affiliated ball is very difficult to get into so I had to take the independent route first in order to get my foot in the door. Independent ball was a good and humbling experience, and the Midwest League was loaded with talent. After the 2009 season with Midwest was over, I was fortunate enough to get a call from Dave Keller and the Chicago Cubs. I signed a free agent contract and had an outstanding Spring Training in 2010 with the Cubs, but at the end of the last day of camp I was called into the office only to be told that Toronto would be a better fit. I flew back to Tampa the next day and signed with the Jays a day later. 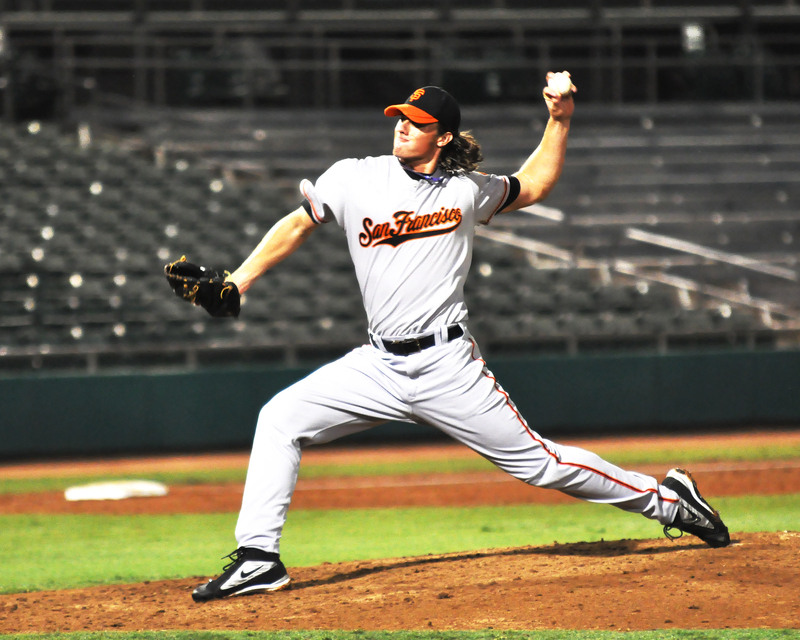 You just finished your SECOND professional season, playing in Vancouver (Northwest League). How did you find your season overall? After spending a year and a half in the extended season and the GCL, I was beyond excited to get to Vancouver. I have nothing but great things to say about the City of Vancouver and its support of the Canadians’ organization. I also have the utmost respect for the Canadians’ ownership, front office, field crew and the rest of the staff and media. From sold out games every night, to sushi races in the 7th inning and the best dancing grounds crew in minor league baseball, the Vancouver Canadians are a class act. Overall, the season was obviously amazing and resulted in winning the league title in our inaugural season. We also got nice shiny rings for it! Personally, I dealt with my ups-and-downs just like all ball players do, but John Schneider, being the type of manager he is, helped me get through both the good and the bad. My prior professional career had consisted of usually two fans (my parents) and 100 degree temperatures during one o’clock games in the GCL in Florida, so hitting home runs and calling good games under the lights in front of 6,000-plus fans a night was priceless. Being in pro ball just two years and already having a championship ring is definitely a blessing. Regardless of the level you play at, it’s always a great feeling ending the season number one. What kind of contact have you received from the Jays fans since joining the organization? Still being at the lower levels of the organization, I haven’t received much contact from fans in Toronto (Editor’s Note: That is about to change…evil laugh). 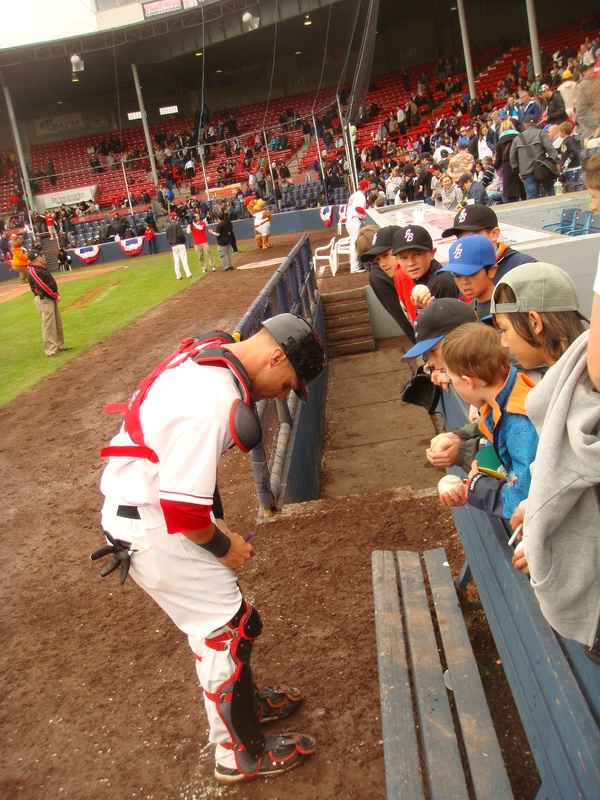 Vancouver was an awesome experience because good game or bad, I always made it a point to stay after games outside of the dugout and sign for kids and fans. I feel that if the fans are making the effort and spending the money to come watch me play a game, then I can take 5 minutes out of my day to possibly create a lifetime memory for a kid by simply signing his glove. A promise that I have always made to my family and especially my mother is that no matter what level I get to or how much success I have, I will ALWAYS reach out to the fans and interact. I recently had a little competition on twitter (@GMaines8) with all of the Jays and MLB fans that I am lucky enough to have follow me. Those are the little things that I enjoy doing being in the position I am in, and hopefully in the future, I am able to continue my relationships with the fans. You are seen most of your time at catcher since joining the Jays. Is that your long-term position? 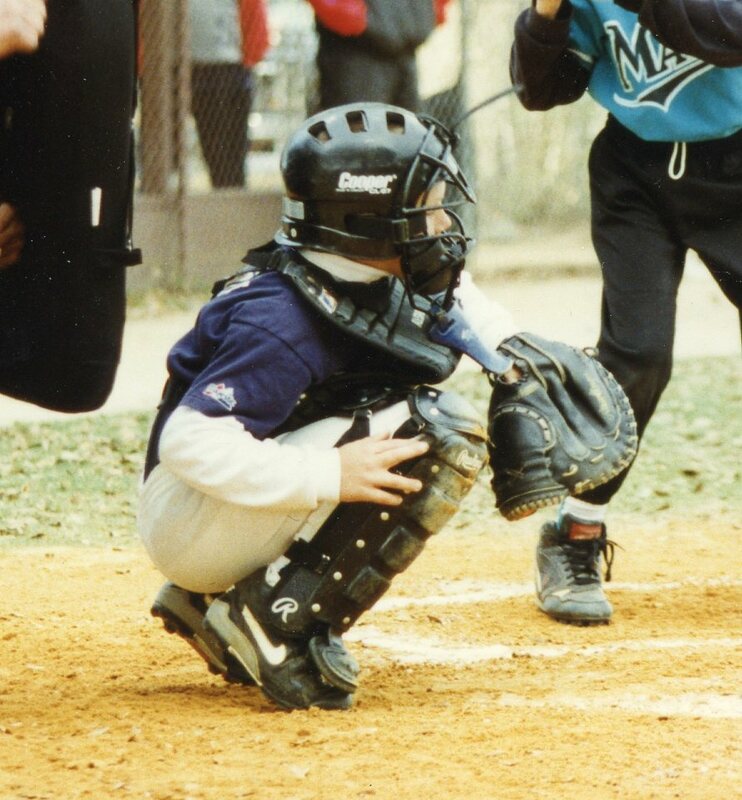 I have been a catcher my entire life and signed with the Jays as a catcher. But toward the end of last season I began taking some ground balls and getting some work in at third base (and I even pitched in one game) in hopes of improving my value, getting more at-bats and hopefully getting to the show! I have made it clear to the Jays organization that I am willing to do whatever they need and play whatever position they want me at in order to move forward with my career. My goal is to contribute in any positive manner to the success of the team that I am playing for by being a multi-faceted player. 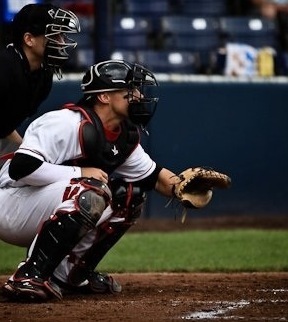 As far as long-term, whether I am behind the dish or on the field as a position player, it doesn’t really matter as long as I am between the white lines. What do you consider your greatest baseball skill(s)? As a catcher you want to try to avoid being good at ONE particular thing. 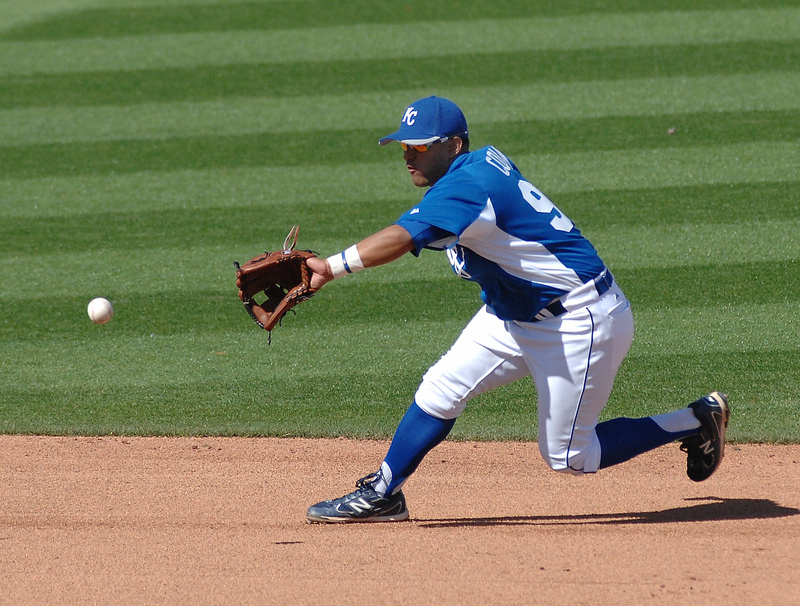 You want to focus on polishing a little bit of every skill required of a major league catcher. If I had ONE tool that would separate me from others, it would be the energy and leadership which I possess. I hope the Jays organization is beginning to realize that I bring energy, intensity and leadership to the game. Although you want to maintain a level head and calm demeanor behind the dish, I feel like there still needs to be sense of energy and intensity. I personally like the way Francisco Cervelli (New York Yankees) plays with his swag and high energy style of play. I have gotten opportunities to work with him and talk to him this off-season. He said he learns by watching video of the Molina brothers, who catch with a completely opposite demeanor than him! He says this because he realizes he has to be “cat like” similar to the Molina’s. But he also makes it clear that he got to the big leagues by cementing in his pitcher’s and team’s minds that whether his team is up by ten runs or down by ten runs- he will be alert, intense and energetically focused. Energy, intensity and the handling of staff are the tools I feel that I posses defensively. Offensively, I feel it’s icing on the cake if you can find a catcher that can swing it. Although my at-bats were limited with the Canadians, I feel like I put up numbers that were respectable and feel that with 300-400 at-bats, I could put up very respectable power and production numbers. I felt as the season went on in 2011, I became a more professional hitter and my approach during each at-bat was getting to where it needed to be in order for me to produce. I am very confident in my offense and it’s due in part to what the Jays organization has done with me and the effort they have put into making me a better hitter each day. It is also due to my work ethic both during the season and offseason. Hopefully as my career moves forward, I can continue to contribute to my team’s success through my approach to the game. What facets of your game do you most wish to improve upon? Every single day both during the season and offseason, I am trying to improve on something in my game. Whether it be defensively or offensively, I constantly try to get better- either in the gym or on the field. This past offseason, I spent a few months improving my flexibility and mobility in order to preserve my body and prepare physically for the seven month grind. If I had to pinpoint one particular skill set or mindset I would like to improve on, it would be to continue to slow the game down and let the game come to me a little bit more. In just two seasons, I have improved dramatically both offensively and defensively and I am anxious, curious and dedicated to finding out just what I am capable of accomplishing in this game. What do you need to do in order to be successful in this game? It’s kind of hard to define what exactly is considered “success” in this game. Obviously making it to the big leagues would be considered successful in most people’s eyes, including mine. One thing I can and will be successful at is to be the best at controlling what I can control. My priorities both on and off the field are where they need to be in order to be “successful” and I believe that the rest will work itself out. My work ethic speaks for itself and I am doing everything I can possibly do, both physically and mentally, in order to be successful. If you had to look into a crystal ball, when do you see your expected time of arrival in the big leagues and what do you think you need to do most to get there? Having two years as a pro under my belt and spending time in the offseason around former and current big leaguers, I have come to the conclusion that there is no crystal ball! There is no formula! What the crystal ball doesn’t include is determination, perseverance, dedication, injuries and most importantly: opportunities. There are too many intangibles to try to pinpoint a big league arrival date. Ideally, I would love to be a big leaguer by the age of 27, but who’s to say what the right age is? In order to get there I have to continue to focus on the things I can control and to be the best at the role in which I am given. Last question: When did you sign your first autograph? The very first autograph I think I ever signed was when I was 10-years-old and I hit the game winning home run for the South Brandon Little League at the District 13 All-Star Tournament. I remember after the game I was bombarded with fans, older players, local high school players who I idolized at the time and THEY asked me for my signature! I will also never forget signing my first professional baseball card for a fan who flagged me down before a game in Vancouver last year. I had not even seen the card prior to the kid handing it to me. So I saw my first baseball card and signed my first baseball card all at the same time. It was surreal. I even told the kid and wrote on the back of the card that it was my first signature on my very own baseball card. Posted on February 26, 2012, in Interviews with MLB Stars and tagged baseball, blue jays, catcher, derek jeter, francisco cervelli, garrett maines, john schneider, mike redmond, mlb, prospect, toronto, vancouver canadians. Bookmark the permalink. Leave a comment.